The appearance of the seventh volume of The Total Synthesis of Natural Products signals the continued health of the art and science of organic synthesis. This new volume contains a chapter updating monoterpene synthesis and reviews the newer areas of leukotrienes and macro-cyclic lactones. 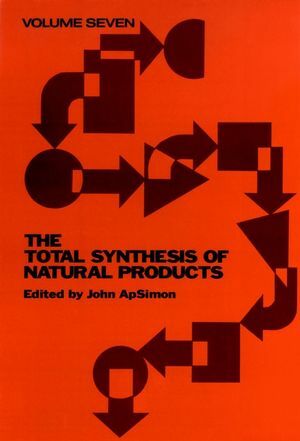 The Total Synthesis of Natural Products, Volume Seven forms an integral part of the invaluable working reference begun in Volumes One through Six, to which chemists may turn for the available data on the total synthesis of complex molecules. Lessons learned from the synthetic challenges presented here by various natural products will serve as a sound base for this continually evolving field. About the editor John ApSimon received his Doctorate in Chemistry from the University of Liverpool in 1959. He teaches at Carleton University, Ottawa, where he has been since 1962. He is a former Senior Editor of the Canadian Journal of Chemistry and is currently the Associate Dean and Director for Research at Carleton University. The Total Synthesis of Macrocyclic Lactones (H. Boeckman and M.Goldstein). Synthesis of the Leukotrienes (J. Rokach, et al). The Synthesis of Monoterpenes, 1980-1986.